In each of the three sections of this book is a prose poem meant to be read aloud in which a character, interacting with other characters, is named for a quality. They are Beauty, Happiness, and Patience. The author is strong on parables: "Parable of Divas," "Parable of the Chicken Wing," "Parable of Ancestors," "Parable of Kings & Queens," and "Sugar, or Parable on Liberals." We find the characters in this book in beauty salons, in a tornado, on a porch, and in various locations where discuss and interact with one. another. The author's style is interestingly unique. Troubled Tongues was the winner of the 2006 Naomi Long Madgett Poetry Award. 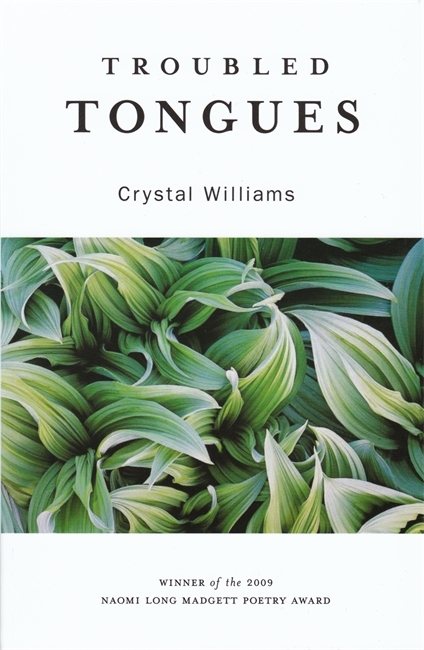 Crystal Williams was raised in Detroit, MI and Madrid, Spain. She earned a B.A. at New York University and a Master of Fine Arts at Cornell University. She is currently Associate Professor at Reed College in Portland, OR and divides her time between Oregon and Chicago. She is the author of two previous poetry collections, Kin and Lunatic.